Freefall 200kph over 'Middle Earth'. Unique tandem skydiving experience, 15,000ft above Mt Aspiring and Fiordland National Park. Unforgettable and truly life-changing. You'll be picked up from Central Queenstown and driven through breathtaking scenery to the take-off point. The journey only serves to tease you with just how awesome your jump is going to be once you get airbound. After a comprehensive safety briefing and training, you'll embark on your flight. Choose from a 12,000ft or 15,000ft jump, and get ready for the ultimate adrenaline rush. Fly over Lake Wakatipu and the mountains of Glenorchy as you climb to your chosen height. Then let your instructor take over as you both leap into the skies. 'Enjoy' a freefall of up to 200kph, marvelling at the panoramic views below you, before your parachute billows open and lets you fall gently to earth, giving you time to really drink it all in. Jumpers can purchase photos and video USB of their adventure, and you'll be able to tell all your friends that you flew over real Hobbit country. The mythical world below you was used in many scenes in Peter Jackson's 'Lord Of The Rings' film trilogy. 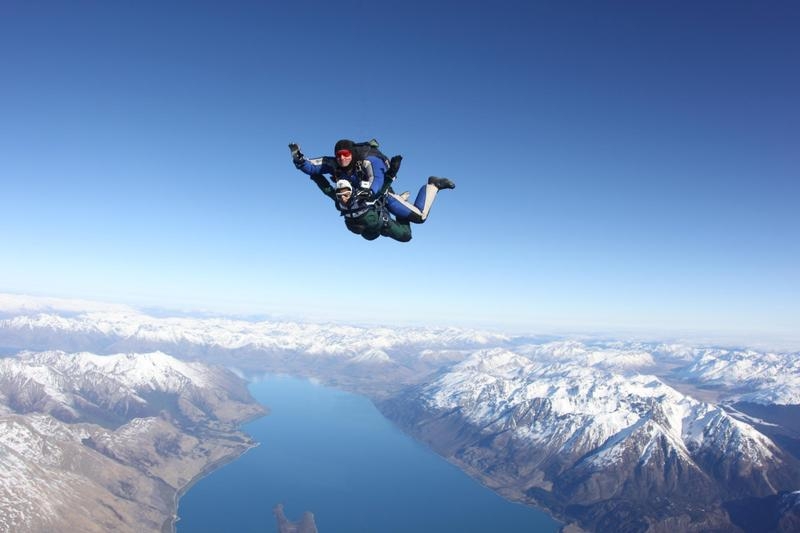 Please visit Skydive Southern Alps for bookings and latest price information.